Back with a short Balkans travelogue update! After our visit to Plitvice Lakes National Park, we head off to Pula, our resting place for the night. It was also our last night in Croatia! Pula is the 8th largest city in Croatia, situated at the southern tip of the Istria peninsula with a population of about 57,000. 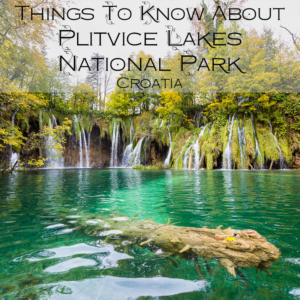 It was a 3-hour drive from Plitvice Lakes National Park, so by the time we reached Pula it was already close to evening. After parking our car at our accommodation, we walked to the historic town center. 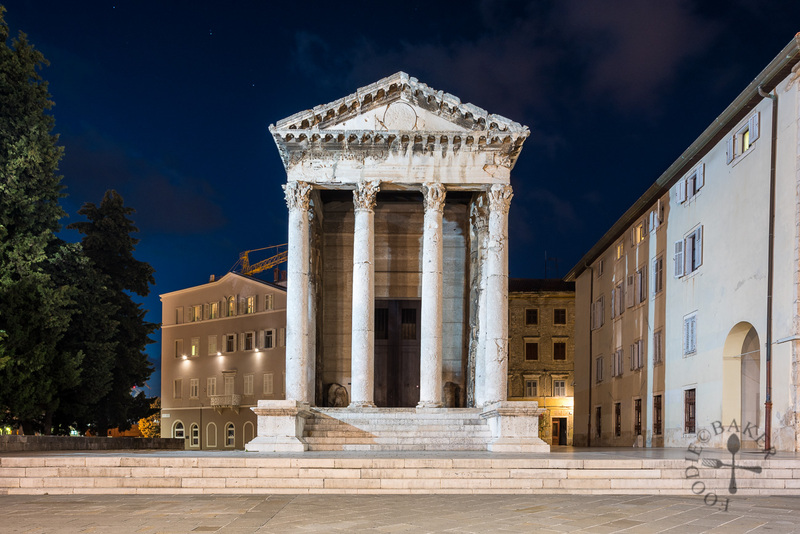 As the Istria peninsula was conquered by the Romans in 177 BC, it is not uncommon to see Roman structures in Pula. 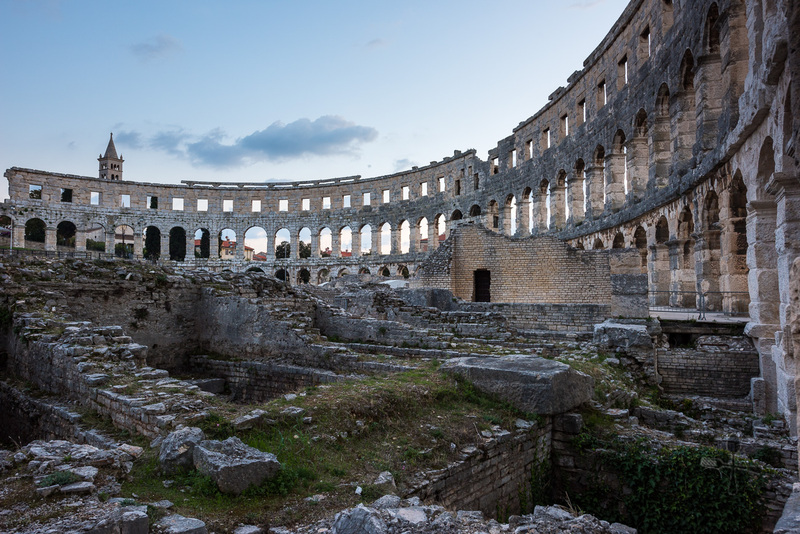 The Pula Arena, constructed between 27 BC to 68 AD, is the sixth-largest Roman amphitheatre and one of the best preserved in the world. 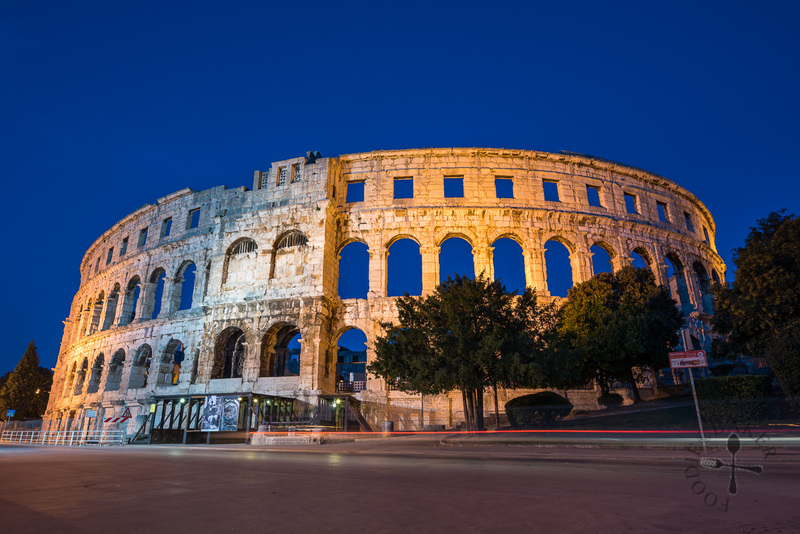 The Arena is the only remaining Roman amphitheatre to have four side towers and with all three Roman architectural orders entirely preserved. As the arena was already closed by the time we reached, we only took a peek inside. The amphitheatre remained in use until the 5th century, after the ban on gladiatorial combats was imposed by Emperor Honorius. Despite a long unused period, the amphitheatre remains in remarkable condition and is a popular example for studying of ancient building techniques. 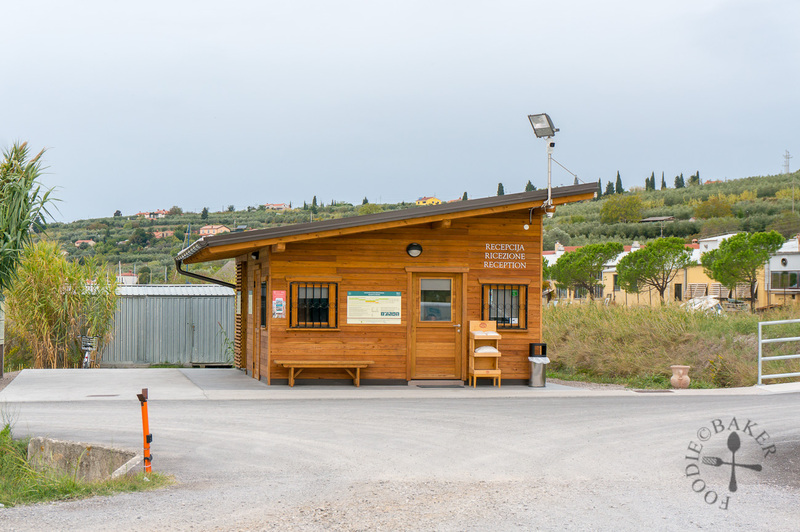 Today, the amphitheatre is used to host concerts, cinematic works and even ice hockey games. Reminds me of the Colosseum in Rome, Italy, just a lot less crowded! The Temple of Augustus was constructed between 2 BC and 14 AD, and dedicated to the first Roman emperor, Augustus (hence the name). The temple stood out as we walked past it as it was the only building from the past – the rest of the surrounding buildings are modern-looking. There’s not much to do in Pula at night, so we had dinner in a random restaurant and head back for the night. The next day, we continue our drive to Slovenia, where we would be spending 8 days of our 25-day Balkans trip. 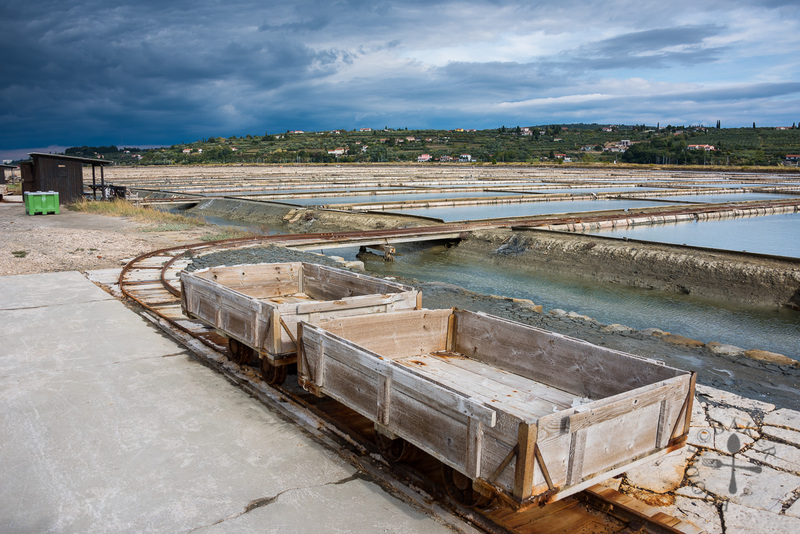 Our first stop in Slovenia was Sečovlje Salina Nature Park (aka Sečovlje Saltworks), which is located very near the Croatia-Slovenia border. 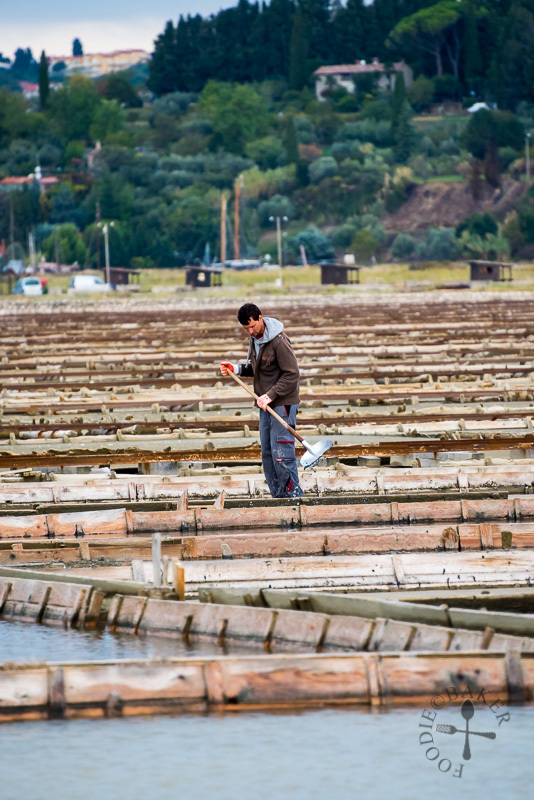 Being a foodie, Sečovlje Salina Nature Park is one of the places I was looking forward to during the trip – unfortunately, the salt is harvested from June to end of September, hence when we were there in October, there were no salt mounds in sight at all. 🙁 Nevertheless, it was nice to walk through the park, read and learn about this ancient method of salt production. 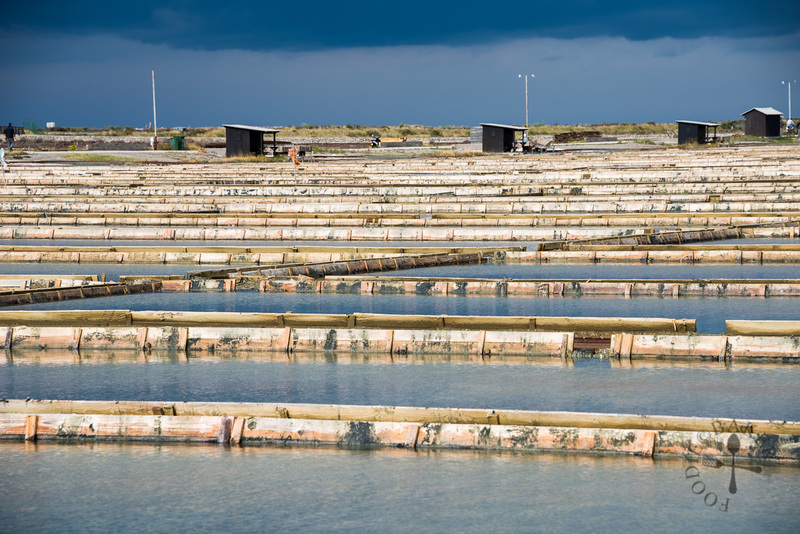 Do you know that salt was once rare and precious? Not only is it delicious on food and a great food preservative, great empires grew on salt, soldiers were paid with salt, armies were equipped with salt, and salt was considered the first subject of trading and first taxed commodity! If you happen to be near there from June to September, don’t forget to head over there for an educational visit! 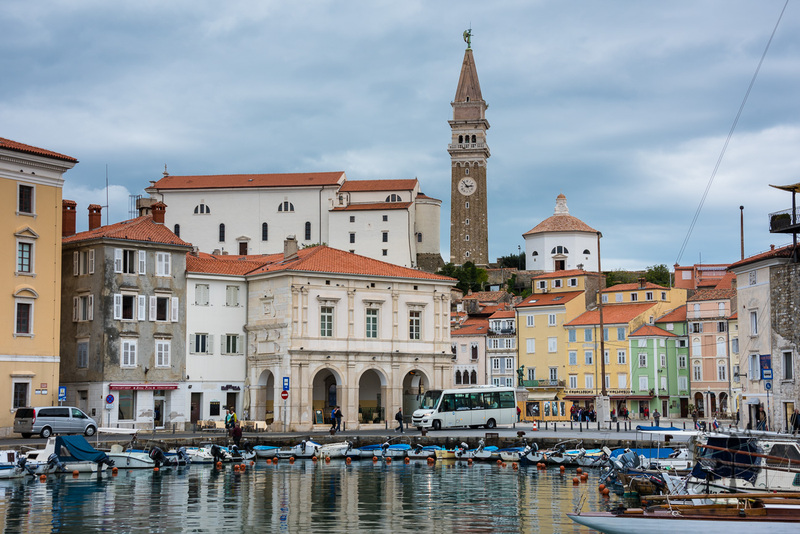 Piran is a small coastal town, reputedly the most beautiful and photogenic towns on the Adriatic coast (hence it has a beautiful nickname – The Pearl of Slovenian Mediterranean Coast). 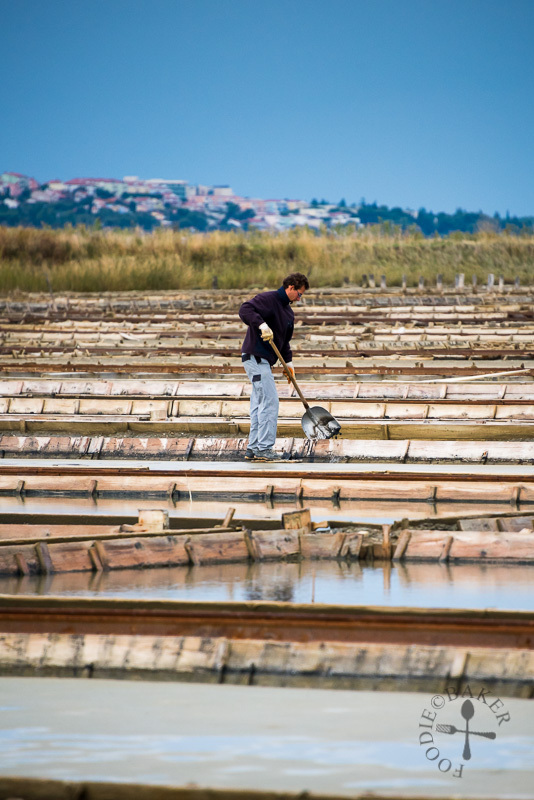 As the town is located near Sečovlje Salina Nature Park, salt harvested from there can be found in the town. Cars are not allowed in the old town, so we parked our car at our accommodation (which was located slightly outside of Piran old town) and walked down to the old town. As we explored the town, we noticed that there are parking available around the old town, just not sure of the parking prices. 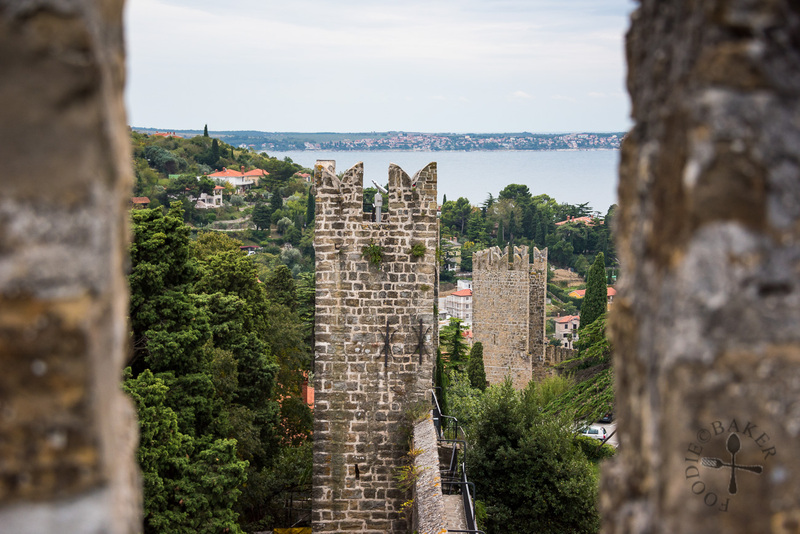 Piran Town Walls dated back all the way to the 7th century, which was also roughly when settlement began to develop. 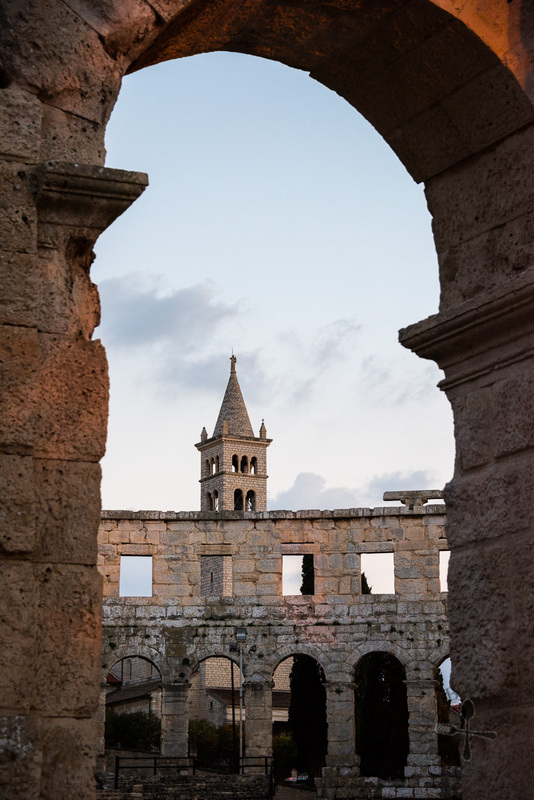 It was built for defence purposes, and as Piran prospered and expand, the walls were also expanded. As the walls were built along the hill, getting to the walls from the Old Town requires some climbing (and of course there’s more climbing after entering the walls). 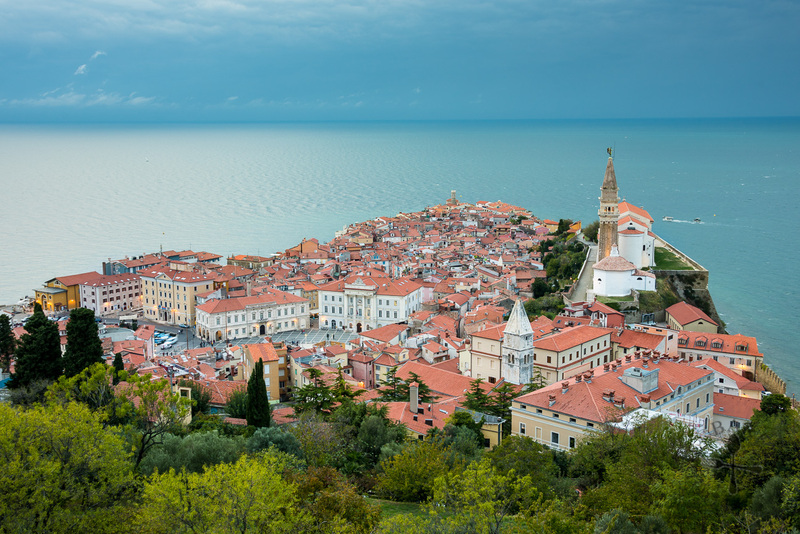 However, it’s worth it because it’s the best way to get a panoramic view of Piran! After we got down to the Old Town, we went to the tourist information center (45.528894, 13.568058) to get a data SIM card for our phone. We got the Visitor Sim offered by Si.mobil, which provides 15 days of 10GB internet access at 15€. Saw a really cute cat while exploring the small alleys of Piran! Piran Old Town is really pretty small, so it didn’t take long to fully explore the place. We ended up near the port for a coffee break while waiting for the sun to set. 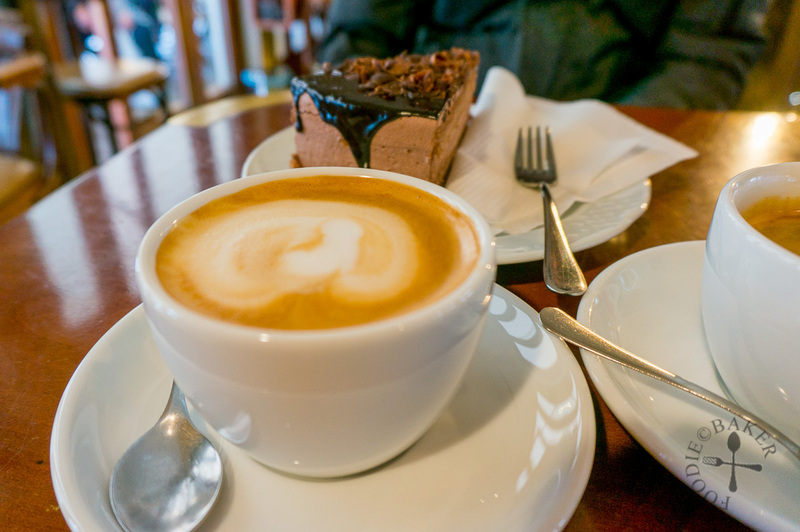 Coffee break – the coffee and cake was pretty good, so give it a try when you want to take a break! 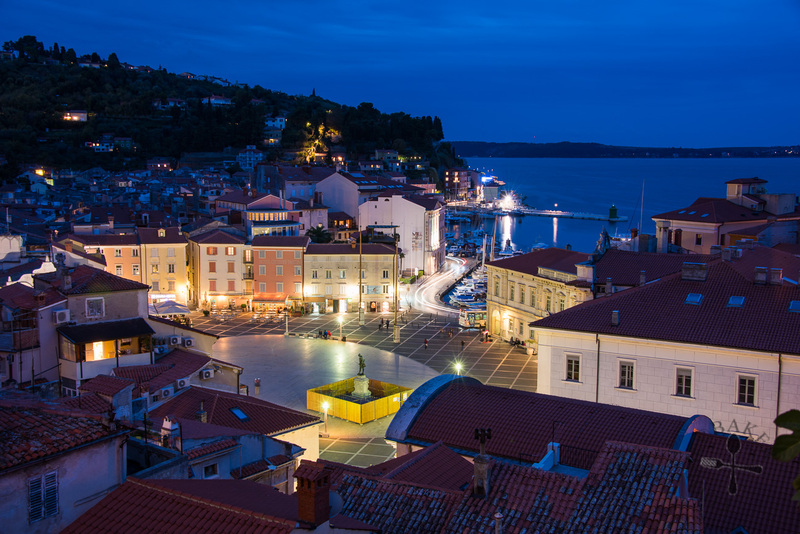 As night falls, X went around taking blue hour photos while I chill at Tartini Square, the largest and main square in Piran. The square was originally a harbour for fishing boats and the harbour was surrounded by important buildings like the Town Hall and Court House. However, due to the foul smell and filth, and for sanitary reasons, the harbour was filled in and a square was built. 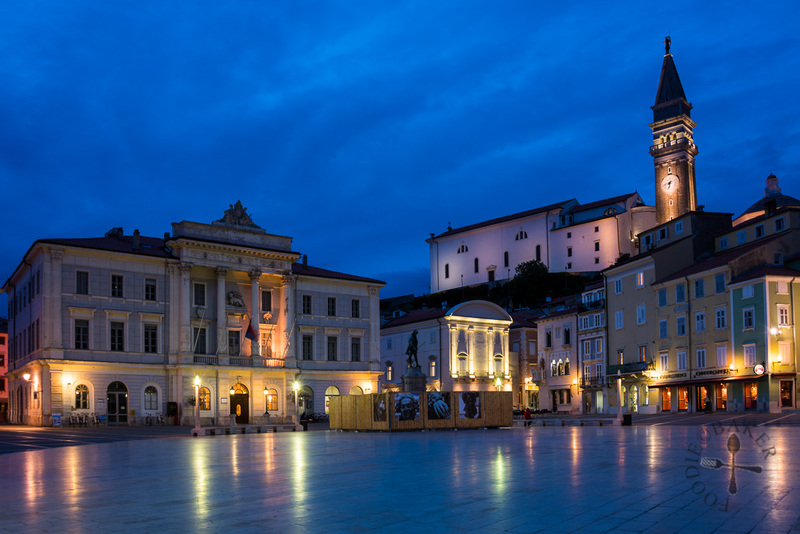 Tartini Square – can you spot me? The square was named after violinist and composer Giuseppe Tartini – a statue of him was erected in the square in 1896 (the one surrounded by panels in the photo above). And it’s time for dinner! 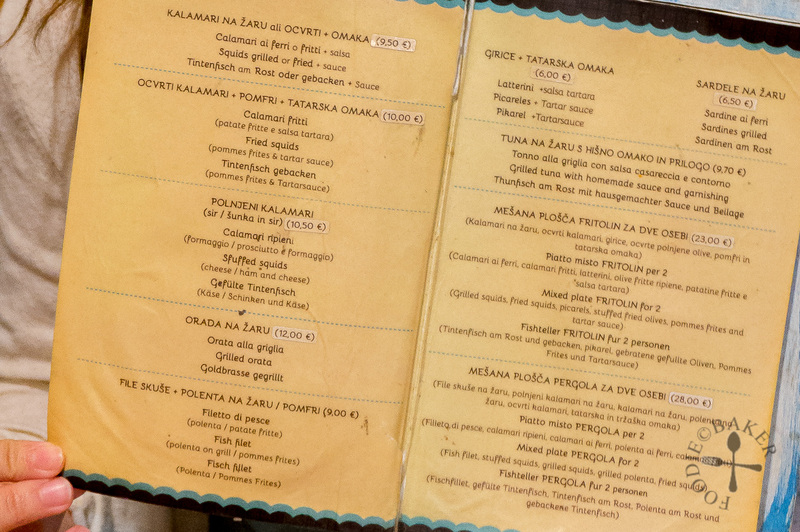 While X was taking photos, I went researching for a place for dinner – and I found this very interesting bar-restaurant called Okrepcevalnica Cantina. There are indoor seating in the bar and outdoor seating at the terrace. It has an interesting concept – drinks are ordered like how you would in restaurants (someone will come and ask what drinks you want) but for the food, you will have to order through a small window located next to the bar. The food is then collected about 15 to 20 minutes later. The alcohol is cheap – 1€ for a glass of wine and 2.50€ for a pint of beer! 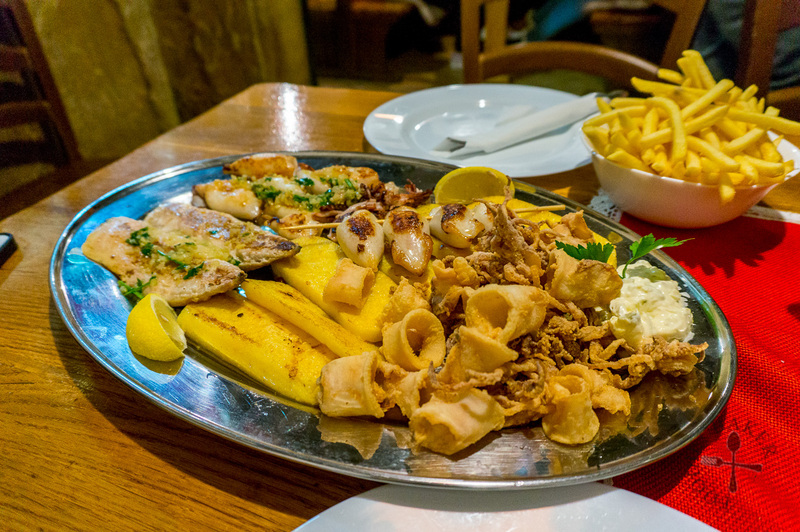 We ordered the Mixed Plate for 2 and a serving of fries – the portion was generous and the seafood fresh and absolutely delicious, definitely a hidden gem! And that’s it for our first night in Slovenia! We will be exploring a cave system in the next travelogue, stay tuned! 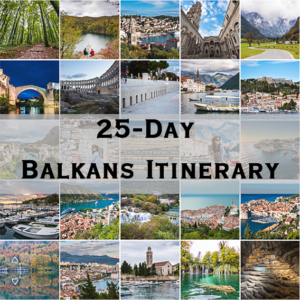 Meanwhile, see our previous travelogues or our 25-day Balkans itinerary and budget!